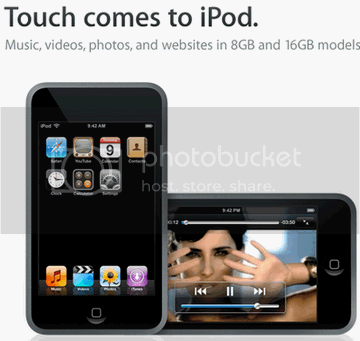 You are here: Home » iPod Touch, a great alternative for iPhone? Without a doubt, iPhone is a great piece of work. I love its revolutionary touch interface, the wi-fi capability and the large widescreen display. You can read more about my views on it here. I love the iPod nano and used it a lot before I got my SonyEricsson w810i. It is from the Sony Walkman series and with a 2GB Memory Stick Duo, I am a happy camper when it comes to listening to music. The music quality is awesome but the music player interface itself could use some improvements. As I was thinking that I would absolutely get an iPod Touch before I’d dream of getting an iPhone, Kyle reports that Apple has dropped their prices on iPhones (and on new iPod Nano iPod Classic)! It looks like they are dropping the ball on their 4GB iPhones and hence the price adjustments. And a huge one at it in just 2 months after its launch. They have dropped a whopping $200 on the 4GB and 8GB iPhones to $299 ($499 earlier) and $399 ($599 earlier) respectively! Talk about paying a premium for the new gadget addiction. I wouldn’t be happy now if I had bought an iPhone when it launched. Update: Apple is responding to its angry customers and offering $100 Apple store credit to the early iPhone adopters. Read more here.. Still can’t get over the fact that it’s only 16gig. I’ll get it once they up it to 30. Heh, those two look very much alike it’s confusing. @Kenny.. welcome to ShanKri-la and thanks for taking the time to comment. Wow, what are you guys going to do with all those GB? I’ve had an iPod for 4 years now (a few different models), use it at least 6 hours a day, and still only have about 1 GB on it. I did see a iPod Touch video which got me all excited about it. They have also confirmed its an iPhone without the phone. It has all the applications, cover flow, etc. Any product from Apple ends up great. I like both the iPhone and the iPad from Apple but being a cell phone user from the start prefers the iPhone more. iPhone 5 is already launched and I wonder how many features are stuffed in that phone.